Of course we know better. We humans won't jump into a pot of boiling water. We're not happy when members of our species start dying around us. But frightening new scientific findings have forced us to look at a larger reality: the bottom-up damage that radioactive fallout may do to the entire global ecosystem. When it comes to our broader support systems, the corporate energy industry counts on us to tolerate the irradiation of our fellow creatures, those on whom we depend, and for us to sleep through the point of no return. Case in point is a new Smithsonian report on Chernobyl, one of the most terrifying documents of the atomic age. Written by Rachel Nuwer, "Forests Around Chernobyl Aren't Decaying Properly," cites recent field studies in which the normal cycle of dead vegetation rotting into the soil has been disrupted by the exploded reactor's radioactive fallout. "Decomposers -- organisms such as microbes, fungi and some types of insects that drive the process of decay -- have also suffered from the contamination," Nuwer writes. "These creatures are responsible for an essential component of any ecosystem: recycling organic matter back into the soil." Put simply: The micro-organisms that form the active core of our ecological bio-cycle have apparently been zapped, leaving tree trunks, leaves, ferns and other vegetation to sit eerily on the ground whole, essentially in a mummified state. Reports also indicate a significant shrinkage of the brains of birds in the region and negative impacts on the insect and wildlife populations. Similar findings surrounded the accident at Three Mile Island. Within a year, a three-reporter team from the Baltimore News-American cataloged massive radiation impacts on both wild and farm animals in the area. The reporters and the Pennsylvania Department of Health confirmed widespread damage to birds, bees and large kept animals such as horses, whose reproductive rate collapsed in the year after the accident. Other reports also documented deformed vegetation and domestic animals being born with major mutations, including a dog born with no eyes and cats with no sense of balance. To this day, Three Mile Island's owners claim no humans were killed by radiation there, an assertion hotly disputed by local downwinders. Indeed, Dr. Alice Stewart established in 1956 that a single X-ray to a pregnant woman doubles the chance that her offspring will get leukemia. 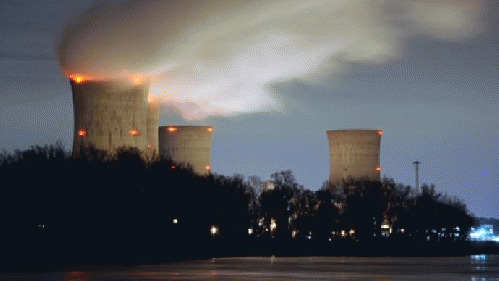 During the accident at Three Mile Island, the owners crowed that the meltdown's radiation was equivalent "only" to a single X-ray administered to all area residents. Meanwhile, if the airborne fallout from Three Mile Island and Chernobyl could do that kind of damage to both infants and the non-human population on land, how is Fukushima's continuous gusher of radioactive water affecting the life support systems of our oceans? In fact, samplings of 15 tuna caught off the coast of California indicate all were contaminated with fallout from Fukushima. Instant as always, the industry deems such levels harmless. The obligatory comparisons to living in Denver, flying cross country and eating bananas automatically follow. But what's that radiation doing to the tuna themselves? And to the krill, the phytoplankton, the algae, amoeba and all the other microorganisms on which the ocean ecology depends? Cesium and its Fukushima siblings are already measurable in Alaska and northwestern Canada. They'll hit California this summer. The corporate media will mock those parents who are certain to show up at the beaches with radiation detectors. Concerns about the effect on children will be jovially dismissed. The doses will be deemed, as always, "too small to have any impact on humans."